No, don’t just skip by this review. New Vegetarian Kitchen should not encourage shudders from meat-eaters. This book is a striking and mouth-watering showcase for dishes that just don’t happen to contain bits of fish or animals. Everyday meat-eating is a rare occupation in the 21st century, even for those who would not consider themselves in any way vegetarian. Times and tastes change. These days we choose to eat vegetables because we want a healthy diet and it makes economic sense. One can still buy a shopping bag full of fresh fruit and veg for the price of a couple of steaks. Not many of us still hold to the principle that a meatless meal is no meal at all, but we still need some inspiration. Nicola Graimes has penned a truly practical book that will be welcomed by committed vegetarians, but equally by those who just enjoy good food. One needs to remind oneself that the meat is missing; it’s not a diet plan; it’s not a volume of recipes containing unappetising but worthy ingredients; not a lot of beige and fibery dishes here. Flesh isn’t included but flavour is. Pan-Pizza with Caramelized Onions and Dolcelatte is indulgence at speed. This recipe contains no live yeast and relies on self-raising flour to give the dough a lift. It’s the quickest pizza you will ever make. One can obviously use any toppings but the sweet onion and tangy cheese Nicola suggests is a winner. It’s bound to be a family favourite as the kids can make the base from scratch and it will be cooked before they have time to become fidgety. Sweet Vanilla Risotto Cakes with Caramel Drizzle would be a star in any genre of cookbook. If you can make a regular savoury risotto then you can make these cakes. There is no mystery or artful knack involved here. Just follow this simple recipe and success is assured. Economic ingredients provide a moreish pud for either a family dinner or after a convivial Italian meal. A comforting change from the ubiquitous tiramisu. My pick of the book is Cauliflower and Cheese Custards with Roasted Tomatoes. This is a great way to tempt picky kids into eating a vegetable which is almost as unpopular as broccoli. Cauliflower, in my opinion, always needs good PR. Yes, it has a certain architectural charm but, let’s be honest, it’s no stunner alone. These custards would make a light lunch or a vibrant starter with the tomatoes dressed with both balsamic vinegar and North African harissa paste. 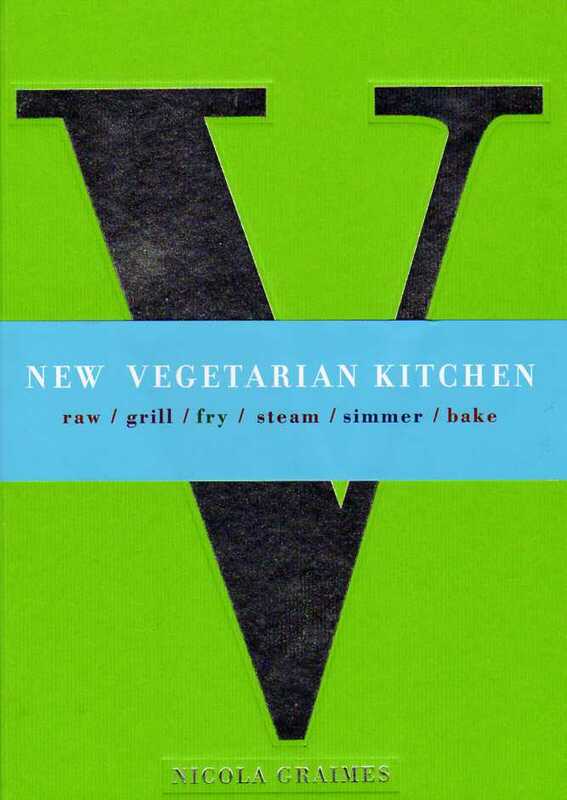 New Vegetarian Kitchen offers new recipes that reflect the way we want to eat today. It’s a good balance of sweet and savoury, exotic and familiar. Attractive to both the novice and the practised home cook. This book, a bag of fruit and veg and a passion for delightful food is all you need to eat well this summer. Perhaps a knife and fork would come in handy.